I am an avid reader of British music publication NME and recently checked out their 2010 cool list to see who they're frenzying over on the other side of the pond. 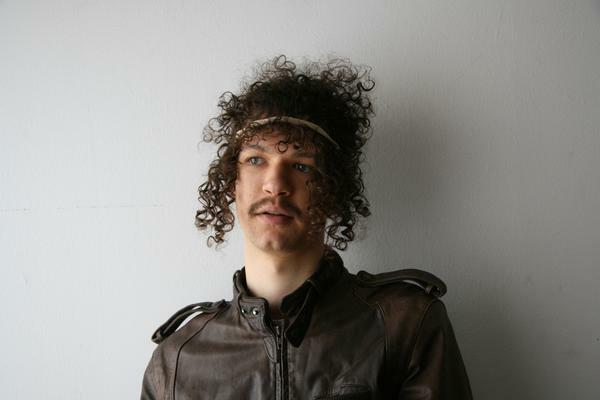 NYC's Darwin Deez was number 10 on that list, and upon checking out the single "Radar Detector" - which has the diffident cool of the Strokes plus a left field sort of David Byrne production - I decided to keep my eyes peeled for his first trip to Chicago. Lo and behold, he was closing out the excellent Tomorrow Never Knows festival Sunday night at Schubas along with Lionlimb, Young Man and S. Carey. The evening was punctuated with the excellent combination of musical experimentation and pop catchiness. There was all the guitar harmony and you could eat. Lionlimb, who are local, opened the evening with an atmospheric type of guitar rock that sounded like what would happen if Girls were trapped in an automobile sinking slowly towards the bottom of the ocean. The intricate guitar work and excellent communication between guitars and percussion left me perpetually wondering whether or not they were going to burst into a pop chorus, and that longing seemed to be the music achieving its goals. Look for more from them. The phenomenally reviewed Young Man took the stage second and shyly began to recall everything from Marquee Moon to Animal Collective. The songs of frontman Colin Caulfield are tender and demanding; they move and change with subtle power and random grace. The crowd loved urging on the coy Young Man, encouraging the band to really let loose and show what they could do, which left me wondering whether that exchange was a part of the young band's appeal. Taking the stage with a loosely choreographed but sincerely committed dance number to Rich Boy's aptly-titled hip hop track "Throw Some D's On It,"' Darwin Deez and bandmates set the mood immediately. They had not touched their instruments and people were fans. As soon as they picked up said instruments they began a series of energetic, carefully odd pop songs that totally justified the hype. And every three songs or so we were treated to another breakdown dance number, always accompanied by pretty innovative mash-ups of obscure pop songs (among my favorites were "Sail Away" and Miike Snow's "Animal"). The recently-released singles "Constellations" and "Up in the Clouds" were big hits. The theatrics would never have come off so well if the songs weren't so damn good, but they were good - lonely, cosmic and optimistic still. The highlights of the evening were the crowd getting in on the party and singing along with the hit "Radar Detector," and Darwin and his guitarist having a freestyle rap battle inbetween tunes, the latter foreshadowing a hip hop release that will soon be available from the frontman. I chatted with the extremely friendly Darwin (who even joined one fan, John, for a photo booth session) and bassist Andrew about coming to Chicago for the first time and also what is was like to be big in Europe. Both seemed excited to be in a new place and on their first American headlining tour. They return to Europe at the end of this tour. S. Carey and band took the stage to headline with their signature layered ghost pop and they too were able to mold the crowd in their own image. The setup brought a unique mixture of voices to the sound and there were, in my opinion, a few more hooks than with Bon Iver, with whom S. Carey plays. The songs rose from one guy playing himself a tune in his bedroom up through the roof floating above Wisconsin trees and snow. The night was nice denouement to this year's fest, with all four acts heralding from somewhere in the future and the past. Really enjoyed the Lionlimb set, planning to "Look for more from them"